Imagine that you are having some guests this evening, but you don’t have enough time to prepare a cake or cookies to offer with coffee or tea. What would you do? Would you go buy something prepared or look for an easy-quick and tasty recipe? If the latter is your choice, I’d like to share a recipe I learnt from mom II. No sweet treat could be easier and tastier than these tahini rolls. Have you tried tahini before? You know it’s a paste made from ground sesame and used in Middle East countries. It’s a great ingredient that you can use in both savory and sweet dishes. Among several ways of using tahini, two of them are the most common ones. One is the mixture of tahini and grape molasses, which is a breakfast food and eaten in Winter days. The other is hummus, which is a great mezze/dip sauce. I guess, the function of it in these two dishes is to balance the flavors. That’s why it could be used in both sweet and savory dishes. Tahini is a perfect ingredient for pastries too. Have you seen these tahini cookies melting in mouth? I must warn you as these are dangerously scrumptious! It balances the sweetness very well that you don’t get fed up with these even if you eat many. These tahini rolls are as yummy! The best part of these rolls is that you can keep them in the refrigerator for almost a week and they are still great! These rolls are crunchy, but still melting in your mouth! Your guests will love them! No extra butter or oil, no egg, no milk or yogurt! You just need 4 ingredients! Coat on top of phyllo sheets with tahini with the help of a brush. No different from painting walls! Sprinkle sugar and walnuts on tahini paste. Cut it into 5 or 6 pieces. Place them in an oven tray. You can drizzle a little honey on each just before serving to make them sweeter. Place phyllo sheets on one another. Coat one half with tahini with the help of a brush. Sprinkle 2 tbsp sugar on it. Roll it firmly and cut into pieces. Repeat the same for the other half. Place a baking paper in an oven tray. Lay the rolls on it and cook them until golden about 40 minutes. You can drizzle a little honey on them just before serving if you want them to be sweeter. You can increase the amount of sugar up to 6 or 8 tbsp depending on your taste. I use phyllo sheets for baklava, which are sold packaged at the markets here as they are thinner than our regular phyllo sheets. If you can’t find it, just use your regular phyllo. What a great idea! What keeps the top of the phyllo from getting dry as they bake? Hi Faye! 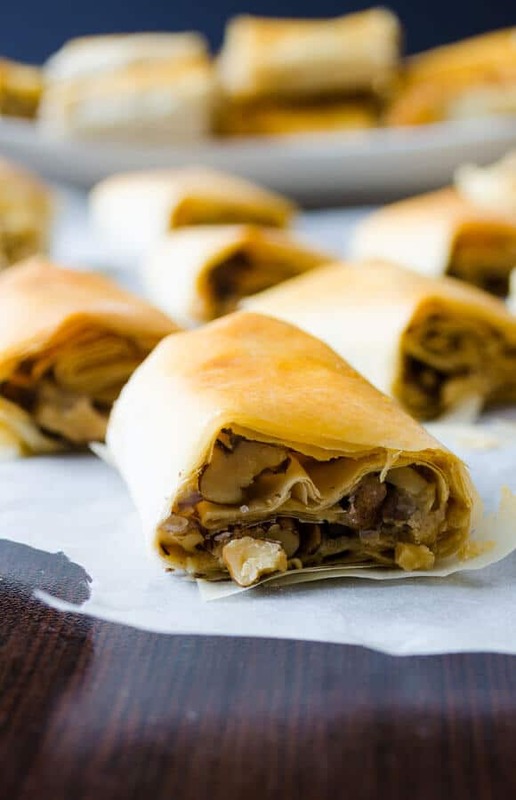 The phyllo becomes flaky rather than dry as it is baked, so you don’t need to brush anything on it. These look soooo good. Will have to try them when my family comes for a visit over the Christmas holidays. We plan to make a ‘Turkish’ meal.